You have no idea how excited I am to post the first one of this years gift guides. They've joined the ranks of Christmas traditions now, and for me, it just wouldn't feel like the festive season had begun without them. So, as usual, first up is stocking fillers for her. 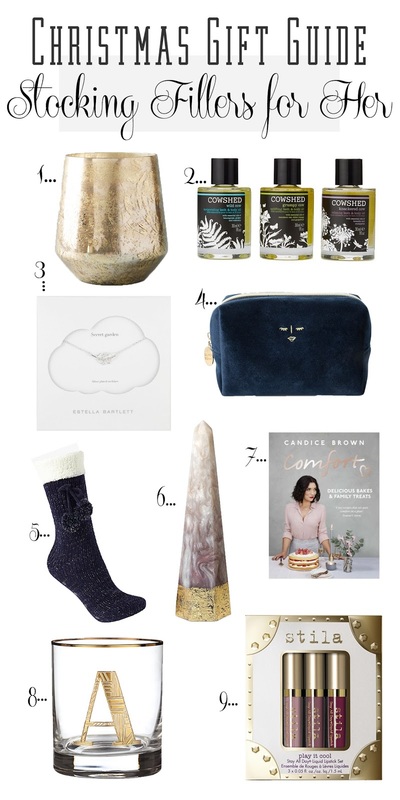 A few of these ideas are on my own wishlist this Christmas -the make-up bag especially, anything navy and velvet, and I'm in love. The monogrammed glass makes a great gift too, Paul and I have one each and they are great for whatever you're drinking. Also the perfect glass for having milk with cookies.